This is the first time I have ever written about spiders. Perhaps I am feeling a little Annie Dillardish that l am inclined to write about eight-legged arachnids. However, in one week’s time, I have had several “spider” encounters that make me feel like this should be my next post. The first encounter, and probably the most profound/interesting, occurred early last week. After a morning walk with the dog, I was sitting on the patio trying to cool off. I noticed that a spider had spun one of the longest looking webs I had ever seen. It stretched from the patio post to the patio table—a good two feet, maybe even longer. The web wasn’t completely circular in shape, but pretty close. After studying the web and the spider for several moments, I observed that the spider began to move. More accurately, he began to deconstruct his web as if he were packing up his luggage and tearing down camp. He moved along his web and ate (for lack of a better word) his silken creation. 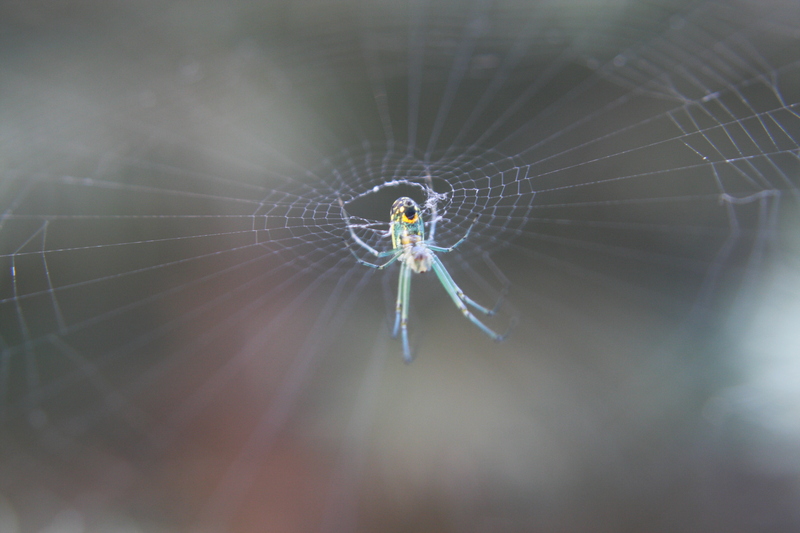 As the spider moved along his line, the web looked like a tiny bubble, forming at the front of the spider’s mouth. Every so often he would stop and digest the tiny bubble. He did this until all that was left was a single strand of web. Using the single strand, he then traveled to the patio post, where he promptly called it a day and tucked himself under the wooden ledge. I haven’t seen him since. I couldn’t believe what I saw! I didn’t know that spiders deconstruct their webs, especially since I seem to be walking into them all the time! Perhaps spiders don’t always behave this way, but I was glad I got to watch this extraordinary moment in an otherwise ordinary day. My second spider encounter was much more up close and personal. Again, I was cooling off on the patio after a workout. Even though I was quite hot, I wanted to finish the last of my coffee. As I set my coffee mug down, I noticed the light reflecting off a web that was not even an inch from my mug, with a tiny spider nestled in the middle. The web was so close to my hand! After several moments of watching the spider, he “relaxed” in my presence and began to move. This time he crawled under the table to hide. Upon my last inspection (a couple of hours ago) the web and spider were still intact. My final spider encounter is really several encounters lumped into one. Our house is situated in the middle of quite a few trees, which means we are a haven for spiders. For the last two summers, I have noticed an increase of spiders in the house during these months. I have gotten to the point where I check the ceiling above my bed before I close my eyes for the night and also scan the bathroom ceiling before showering. I don’t want any furry, eight-legged friends joining me in the shower! I can’t remember the title of the Barbara Kingsolver book I read where she talks about spiders. Apparently, they are beneficial creatures that eat nasty, annoying insects so I am loath to kill them every time I see one in my house. But then again, there are spiders in my house! So why write about spiders? Because when I slow down long enough from my tasks, I never know what I am going to encounter. Watching a spider may not top my list of “wow moments,” but nonetheless I was awed by God’s creation—even if it did have eight legs. You are amazing, in that you portray even the smallest of inscects in such a beautiful descriptive way. What a God given talent you have ! Anna’s picture is amazing as it shows several colors in that spider. If I don’t sleep tonight I will be seeing spiders in my sleep. Love to you both, Mom B.
I really enjoyed your blog today….thanks for the reminder to embrace the moments! Let Anna know that Uncle Mike says “Great Shot”! !